How vintage, elegant & gorgeous!!! 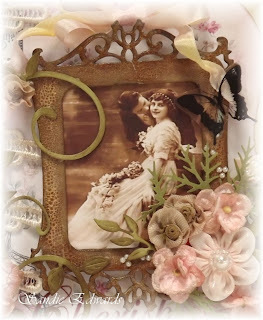 Created using a Kaisercraft wood album, painted with Gesso, and aged using various mediums. I have left the pages blank to show the gorgeous detail in each of the papers. The papers used come from several different card makers, paper packs. Envelopes were added, which would be perfect for holding memorabilia, photographs or journaling. Paper doilies were used to decorate, as well as, beautiful guipure lace and fussy cut elements from various Meg’s Garden papers. A range of flowers were used, and other trinkets.